Our specific attentions is on long distance removals (300 miles+). If your move qualifies please get in touch as we will be happy to produce you most competitive quotes available on the market. We are sure that we can beat most of the quotes provided for private moves and able to deliver most cost efficient price to value service. The more flexible you are the better quote you might get! Aberdeen City: Time starts counting form the moment we arrive to your address until the moment of unloading the last item. Aberdeenshire: Travel time to your place and all way back is taken in consideration as working time and will be charged at the appropriate rate. (Only for Aberdeenshire or further). Aberdeen City removals travel time is free of charge. Please include full name provided on the booking as a reference for the transaction. - Waste disposal service unavailable at this time slot. Take extra care of booking information provided. If you think your booking might take a bit longer for whatever reason, e.g. not 3 hours but 4-5 hours, please book us for a MAXIMUM AMOUNT OF TIME you might need our services. It won't affect your charge if you won't actually use this time for your move. You only pay what your actual move takes. The worst condition could take place if you fail to do that is that we would need to leave your move unfinished and run to another customer coming back after following move will be finished. Its customer's responsibility to ensure that all surfaces in the premises are secured against possible dirt on the removals day. We advise laying some safety material to escape possible affection. Deposits can be paid by Card, Bank Transfer or PayPal. Cash payments are preferable at the end of the move to clear the balance. Other payment methods can take place if prior agreed with the office. Deposit to secure the move should be paid on the same day as original booking took place not later than 8 pm to secure the booking or we hold the right to release it without prior notification. WHAT SERVICE DO YOU PROVIDE? CAN YOU DO WASTE DISPOSAL? We operate 7 days a week from 8 am till 8 pm. We are partnered with quite a few local service providers, as a result, we can execute any move including the same day booking. We would appreciate having at least 2 hours notice to have enough time to prepare for the move and arrive on time. As a usual practice you would pay the deposit after you place a booking with us. The rest should be paid after the move is completed and the final quote is clear for both parties. Cash or bank transfer preferable, if confirmed with the office card payments can take place. DO YOU CHARGE EXTRA FOR WEEKEND SERVICES? No. We have stable rates and quotes that are not changed depending on the day of the week. All prices are stated in the Price List section above of this page. If your move would take e.g. 1h 15min and you require 1 men service (e.g. £40/h) then your total quote would be £50. We start counting the time from the moment we arrive at your pick up location until we finish unloading the last item if your pick up & drop off address located not further than 3 miles from AB11 otherwise, travel time to your place and back to AB11 will be considered as working time. Stable quotes and discounted rates are available for distant or complex moves. Please provide all details preferably over email and we will get back to you within 1 working day as a usual practice. *If your premises located e.g. 1st & 1st / 2nd & 2nd / 3d & 3d then you looking at an appropriate rate multiplier of x 1.4 / x 2 / x 2.5 . Total charges could vary depending on other move circumstances, please check Stable Quotes & Charges paragraph. Rates above apply only for online bookings. WHAT IF I BOOK YOU FOR 5 HOURS LENGTH AND IT WILL ACTUALLY TAKE 3 HOURS FOR A MOVE? HOW MUCH I WILL BE CHARGED? We would only charge you for the time that was actually used for your move so for the situation above only 3 hours charge would apply. Load volume ranges from 6.6 cubic meters on short-wheelbase low-roof models to 11.3 cubic meters on a long-wheelbase high-roof model. The Jumbo long-wheelbase model has a load volume of 14.3 cubic meters. Why paying for the boxes? Even you can find them on eBay or in local store e.g. Travelstock on South College St, Aberdeen (01224 582657) why not to cut some costs of your move? Try to speak to Sterling furniture, Tesco, Makro, Co-operative, Costco, Home base, Asda, B&Q and see if they have any spare for you for free! No booking hours available, please reload the page and try again. Please Note: The time is for our schedule only and you will pay only for whatever your job actually will take. Please choose maximum amount of time your job could take. Because we are based in Aberdeen City Centre we count time from Aberdeen City Centre and backwards. Leave us your contact details and we will call you as soon as we can. Our regulations explain the rights, duties and responsibilities of parties to the agreement between Bravada Removals, our partners and the customer. The word used as "you" or "your" means the customer. The word used as "we", "us" or "our" means Bravada Removals representatives. The word used as "partner" or "partners" means the third party company that is directly involved in the move, dealing with transporting and moving goods for a customer. By confirming the reservation with us you agree to the following terms and conditions. These conditions may be changed or made subject to a prior written agreement between the parties. We are cross-based platform removal company meaning that we define our partnered company to do the removal service arranged thru us. Deposit paid to secure the move represents a fee for our arrangement service only and is not covering any removal costs itself. The total charge for the move should be paid directly to the partnered company by the customer on the completion of the job. If any unpredictable circumstances occur we will try to resolve them with the minimum inconvenience to the customer. As a usual practice, we will investigate the incident and provide our official resolution on the case to both parties involved - the removal partner who did the move and the customer unless alternative solution been offered and all parties agreed on that. We do not take any responsibility for compensations or other reimbursement methods. Responsibility considering any accidents occurred during the move refer to the company who participated physically in the removal or other agreed relative service provided. We will disclose any known information regarding the partner company to the customer only in the condition of serious ground has taken place and a reasonable inquiry has been made. We advise every customer to take care of a parking space as to keep moving process fast and smooth in other case bookings may take longer than planned or expected and as a fact this could lead to a higher total charge. Customer is also responsible for dismantling items unless it clearly agreed in written form that we are going to get this done on behalf of the customer. All instruments needed for the job done must be provided by the customer. Before starting traveling to a customer we will contact you by phone on the day of your booking to make sure you still need our services. No answer will be treated as a booking cancellation. It's customers responsibility to inform our drivers with the best possible parking space otherwise expecting loading time could be extended due to the lack of possibility to park close to collection address. Its customer's responsibility to organize a required number of workers to be able to lift the goods. To the connection of Manual Handling Operations Regulations 1992 ( http://www.hse.gov.uk/pUbns/priced/l23.pdf ) we operate on the basis where we have the last word to define how many men needed to carry the item as it depends on the grip, weight, and premises aspects. If both addresses belong to the Aberdeen City we count duration from the moment we arrive at the pickup point until the moment we finish unloading the last item on the drop off point. If one of the addresses is outside of Aberdeen City we apply extra Travel Charge. It consists of travel duration to pick up location and return duration back to City Centre multiplied by the appropriate tariff. We adjust time every 15min to be as fair as possible for both sides (us and the customer). We care about services safety aspect so we accept official advice from the Department for Transport to take a 15-minute break every two hours on a long journey that counts as a trip time so is paid by a customer. We are a company operating on a time-based basis unless was stated overwise for the concrete booking. It means that you would be charged only for the time used for your order (see TIME CALCULATIONS chapter) * your chosen tariff option. E.g. if you chosen tariff is £40/hour and your job took 2.5 hours you would be charged £100 in total. Every hour of work during out of working hours range (from 8:01 pm-7:59 am) is charged extra £5 per hour on top of the main hourly charge. Extra expenses occur during the move e.g. toll road charge, ferry charge would be payable by the customer. We don’t usually produce exact quotes however if it happened then the customer must state in the booking that he got a verbal or written confirmation from our company to be charged exact amount for his move and state the amount. Otherwise, we will always presume that it’s a standard booking and charge is counted time-based. 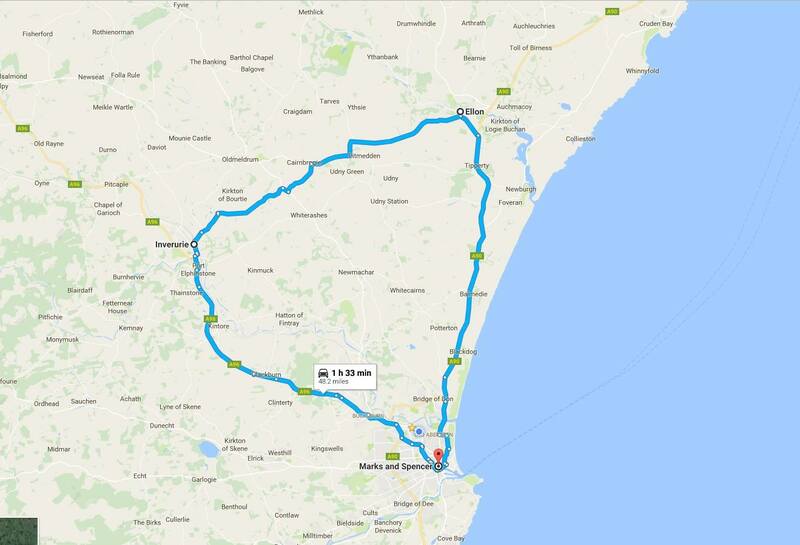 For the bookings of 2 hours and over when one of the addresses is farther away than 15 miles from Aberdeen City Centre we require the customer to pay the balance on the moment of arrival to the drop off destination before the unloading happens. Payment should be done by cash only unless agreed otherwise in writing. Other payment methods can only be considered only if both parties agree. For any run over 2 hours length we advise to book us 48 hours before the start time to make sure we have enough time to prepare for your move otherwise, we hold the right to cancel the booking. Customer has a right to amend his booking twice per booking free of charge. Extra booking changing request would be charged at the rate of £5 per request. We hold the right to release the booking if we have serious ground to think that move is not going to happen. Deposits are not refundable. We might accept cancellations made up to 48 hours before the move and refund deposit only in case if a serious ground took place. Proof of evidence might be required. Late booking cancellations will not be considered. To exclude damage of items, surroundings and to provide secure service we keep the right to decide how many porters needed for the specific job and does the item needs to be dismantled or not. As a usual practice, we do not do assembling however, if any specific conditions were agreed for the move then required instruments should be provided by the customer prior to the start of the work. In another case, we might not be able to provide services on this occasion. Removals services must be done only with the competence of our stuff as to get professional results and escape damages or injuries during the move. If the accident happened and any other third party was involved who had no obligation to proceed these actions and which actions could directly lead to the appearance of the accident we won't be able to consider responsibility for this situation. All concerns about damage made during the removal service must be made directly to the company email ( info@bravada.co.uk) not later than 24 hours passed after the removal service was finished. It's essential to provide information through email on time to register the accident and track the process. Include as much information as possible as to value the situation accordingly and fairly. Late notifications will not be considered. Please provide detailed information of circumstances when the accident happened, if damage occurred please provide damaged items specifics (color, shape, brand name or other important information), photo evidence (at least 2 photos at 1.3MP or 1280x1024 resolution or better) and proof of purchase if possible. This applies to every damaged item, not for the sum of them. Only following these procedures we will be able to disclose any personal details of the partnered company who did the move as to reach the most efficient way of resolving the issue. Either sides (we, our partner or customer) can offer another cost and time-effective solutions for the specific situation. However, it's a must that all parties agree on that as to escape further misunderstanding. If the case when we have serious ground to think that customer hasn't paid or will not pay his bill we hold the right to provide all customers personal information to the third party to deal on our behalf. For any unpaid invoice with the expired deadline on top of the initial unpaid balance adds the statutory interest of 0.3% plus the base rate of 0.2% to the outstanding invoice for every missing day (Late payment of commercial debts act 1998). Customer feedback and suggestions can be made in any preferable way. Complaints must be put in written and send to our email - info@bravada.co.uk. It could take up to 5 working days before we will be able to answer the customer.